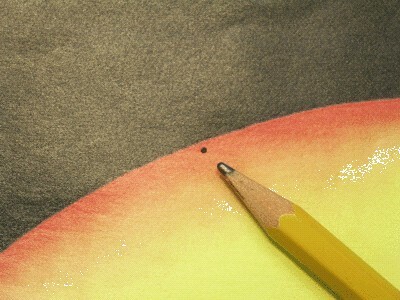 Mercury (black round spot at the limb) in front of the Sun as observed by the Trace satellite in 1999. On May 7, 2003, the planet Mercury passed in front of the Sun as a small dark point. This event was a kind of eclipse of the Sun - however, it is not caused by the Moon but by a planet. 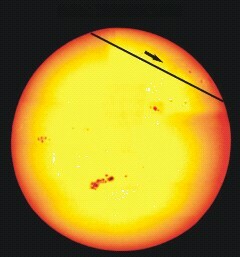 Path of Mercury on the Sun'd disk on May 7, 2003. 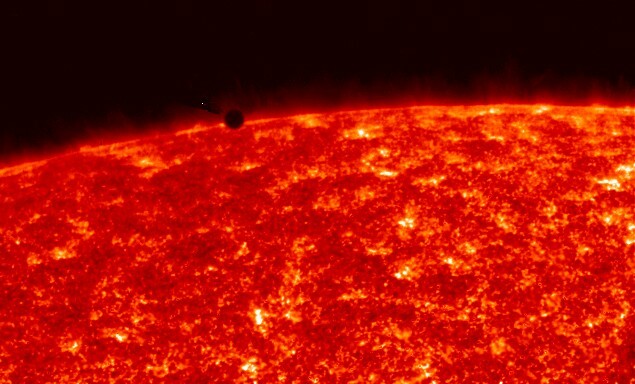 The transit of Mercury across the disk of the Sun was difficult to see - the disk of Mercury is very small and a powerful telescope were needed to make an observation. Note also that such an observation of the Sun is very dangerous for your eyes without special protection. The only really safe way is to project an image of the Sun on a white screen (or paper). Orbits of Mercury and the Earth around the Sun. The planet Mercury orbits the Sun inside the orbit of the Earth and every 3 months, Mercury passes between the Earth and the Sun. However, we do not see a transit on the disk of the Sun each time, because of the angle between the orbital planes of Mercury and Earth. 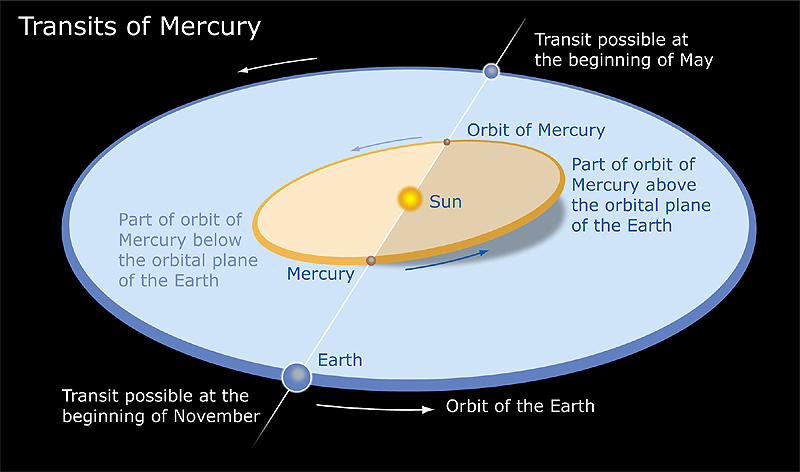 The transit occurs only when the Sun, Mercury and the Earth are near the same line. This occurred last time on May 7, 2003. The transit of Mercury was visible in the V zone. This observation was possible from Europe and Asia. 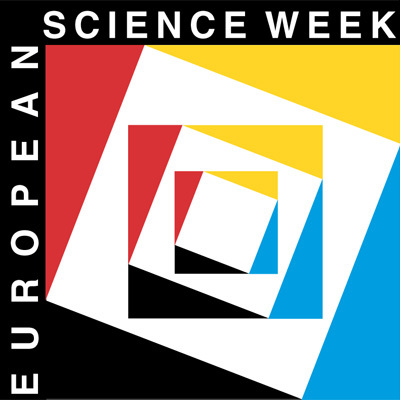 All interested persons were encouraged to contact an astronomical observatory, science center or amateur club in your neighbourhood. Because it was a kind of "preview" of a more important astronomical event. 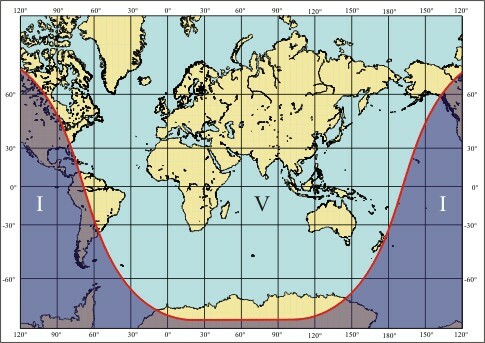 On June 8, 2004, the planet Venus will pass in front of the Sun . Venus is larger and nearer than Mercury and that event will be easily observable. The observation of a transit of Venus is much more rare than a transit of Mercury, it happens only two times every 120 years and no one alive today has ever seen a transit of Venus. In the past, astronomical observations of Venus transits allowed to measure the Universe. You will find the full documentation of the Mercury transit via this page. There are lots of images etc.